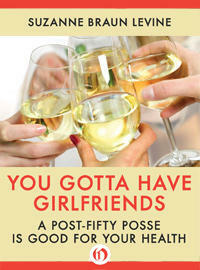 Sat, 5/18 12pm: "One of the best things a woman can do for her health is to nurture her relationships with her girlfriends, especially after the age of 50," says Suzanne Braun Levine in her new e-book You Gotta Have Girlfriends: A Post-Fifty Posse is Good For You Health. Editor of Ms. Magazine from 1972 to 1988, Levine recorded women changing the course of history. Now she chronicles how women are defining a "new stage of life and wellness by living it (life after 50) to the fullest." Susan Loubet did another in a series of interviews with Levine for Women's Focus.